Great news: We have received all the necessary electronics parts to start with the production of the v2.0 iC880A LoRaWAN Backplane! They will be available next week. You can pre-order the boards already now. 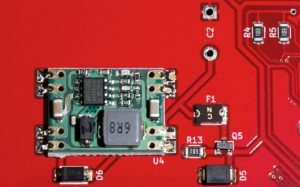 The iC880A Coredump Backplane is a PCB that can be used to connect an iC880A LoRaWAN concentrator board to a Raspberry 2B / 3B or Zero. 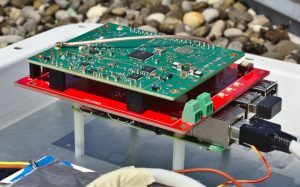 In addition to that, it features several useful features like I²C headers, buttons, LEDs, as well as sensors to monitor key metrics like temperature, humidity and supply voltage. The version 2.0 is not a complete re-design, but an incremental improvement of the 1.5 version. What’s new compared to the older versions? 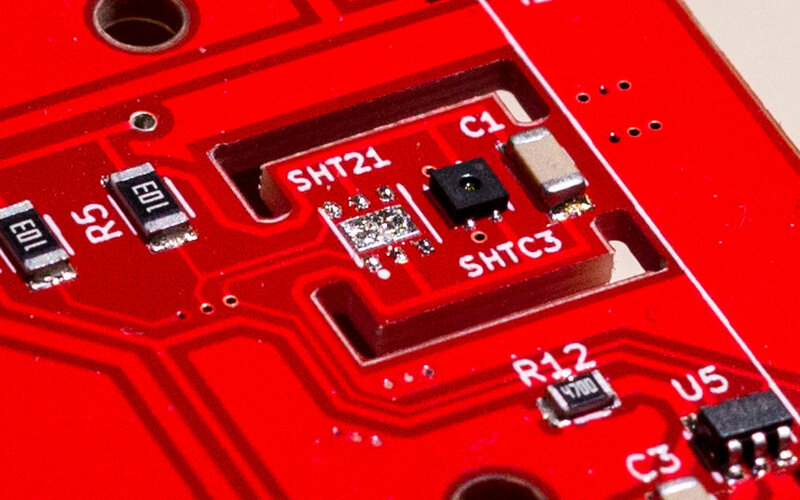 We switched from the Sensirion SHT21 temperature / humidity sensor to the brand-new SHTC3 sensor, released 10 days ago (thanks to them for providing some free samples!). It has higher accuracy (±2%RH, ±0.2°C), is more energy efficient and works out of the box on Raspbian Linux! The SHT21 Linux driver had some issues on newer kernels because of a Raspberry Pi I²C clock stretching hardware bug that needed to be fixed with a patch or with a userland driver. The SHTC3 works perfectly with the shtc1 kernel driver pre-installed on every Raspbian installation! Sensirion produce, test and calibrate their sensors in Switzerland. They are very accurate and reliable. In case you own a Samsung Galaxy S4 smartphone, you have the predecessor of the SHTC3 in your pocket! 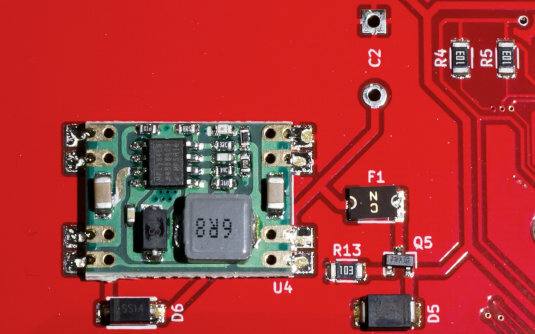 We used to ship our backplane boards with an adjustable step-down DC-DC regulator module based on the MP1584. While the screw-adjustable regulator board had some advantages (it allowed to adjust the voltage if desired), we had to manually adjust and fixate the set screw for every board we produced, causing a lot of work. 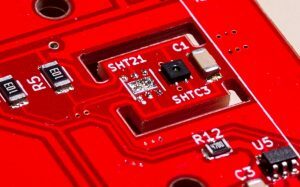 In the new version we use fixed-voltage regulator boards (also based on the MP1584) that we can directly solder onto the backplane thanks to the castellated edges. It also offers an additional bonus: There’s an LED that turns on if you power the backplane! The regulator board allows for an input voltage range of 6.7-28V and provides 3A output with an efficiency of almost 90%. Our previous boards required two stacking headers on top of each other, to avoid colliding with the USB and Ethernet connectors of the Raspberry Pi. This made the stacked assembly unnecessarily high. The new version uses larger stacking headers, so that a single header suffices. This allows the backplane to rest right on top of the USB and Ethernet connectors, reducing the total height. Due to this change, we moved both power input connectors farther down the side of the backplane, so that they won’t accidentally cause a short when they touch the metal connectors. Since we manufacture all the PCBs ourselves in our community-operated hackerspace, we do not receive a batch of ready-to-ship backplanes from our manufacturer. Instead, we solder the boards ourselves in our reflow-pizza-oven. This means that production is a bit slower than when ordering from large companies. A few prototypes have been produced last week and are already sold out due to some pre-orders, but we will start making dozens of backplanes over the next weeks. You can expect at least 10 PCBs to be added to the shop next week! If you want to receive a backplane as soon as possible, you can preorder it. Yes! 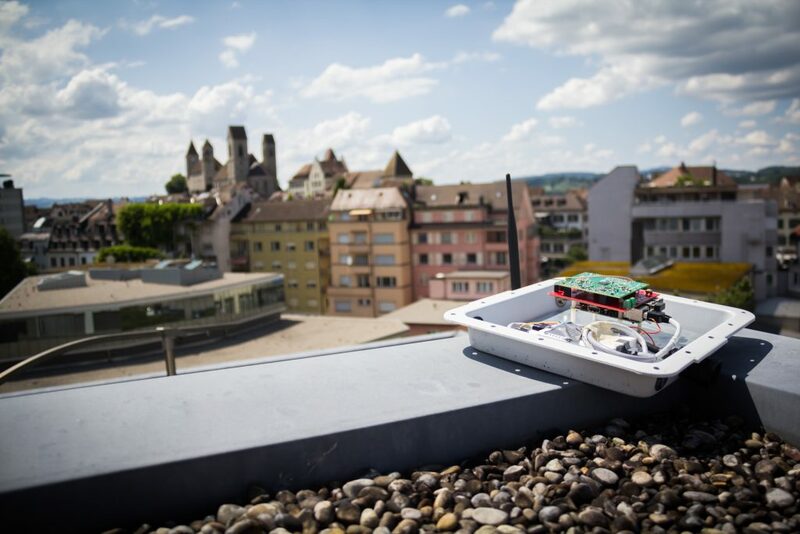 We have deployed a v2.0 backplane (powering a Things Network gateway with passive PoE) on a rooftop in Rapperswil two weeks ago! You can view the monitoring data it collects on our public Grafana dashboard. In case you’re interested in receiving product updates (mostly regarding the iC880A board, in the style of this newspost), feel free to sign up to our new newsletter! One more thing: If you already got the Coredump backplane and are happy with it (or have suggestions to improve it), why not leave a review on our shop page? Welcome to the Coredump Shop! Welcome to our new little shop. Here we will sell things like electronics kits or 3D prints. You can pay us in cash, via bank transfer, via credit card or with Bitcoin. If you have any feedback, let us know! Willkommen in unserem neuen kleinen Onlineshop! Hier werden wir Sachen wie Elektronik-Kits, 3D-Drucke und mehr verkaufen. Du kannst in Bar, per Banküberweisung, per Kreditkarte oder mit Bitcoin bezahlen. Wenn du irgendwelche Rückmeldungen hast, lass’ es uns wissen!